Festive Goat Gift Topper – Hello Holy Days! Giving gifts on Eid? Of course you are! 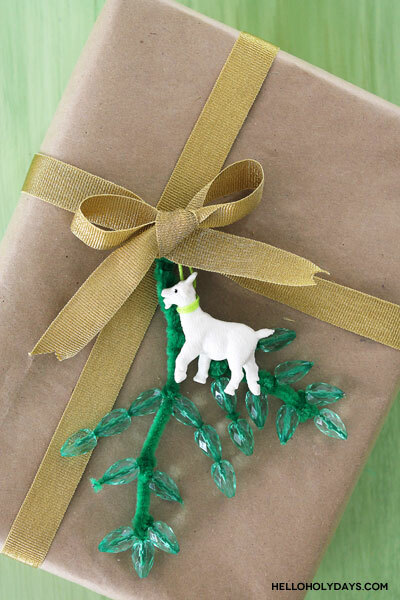 Get the kids involved in the gift giving tradition by making this festive goat gift topper! Beautiful bejewelled leaves flanked with a mini goat will add a touch of sparkle and whimsy to gifts wrapped in kraft paper. It’s a simple and chic way to elevate your Eid al Adha gifts. 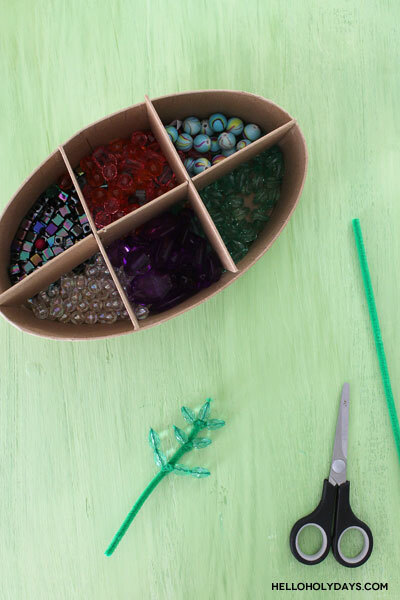 Plus, it only take a few minutes to make with Kid Made Modern’s Jewelry Jam craft kit! Make the leafs of this festive goat gift topper using green pipe cleaners and the leaf beads included in the Jewelry Jam Kit. To do this, cut a piece of pipe cleaner about 5″ long. Then cut smaller pieces of pipe cleaner, in varying lengths such as about 1.5″ and 2.5″ inches long. 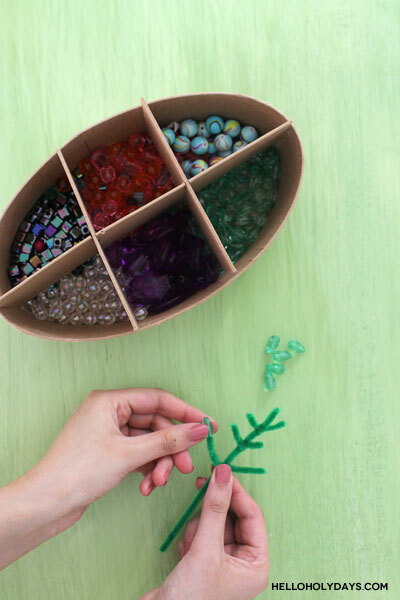 Wrap these around the 5″ pipe cleaner to create a leaf shape. Now you’re ready to add on your gift topper to your gift! 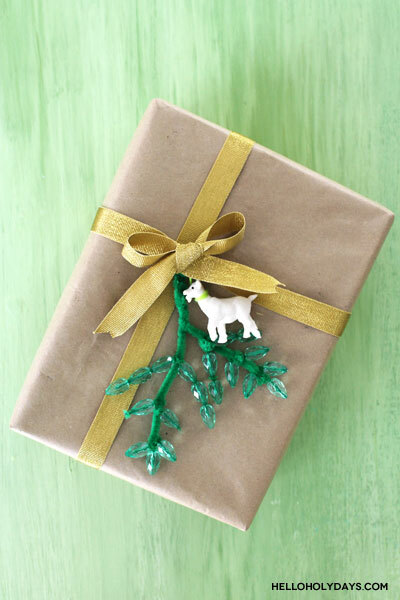 Wrap your gift in plain kraft paper. I’m using a gold ribbon to wrap the gift. 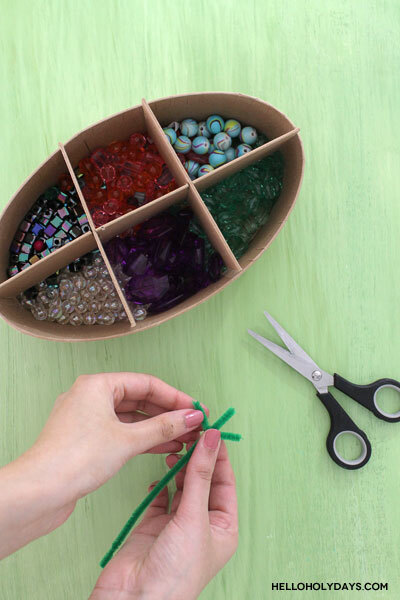 Make one knot of the ribbon and then wrap on your pipe cleaner gift topper. 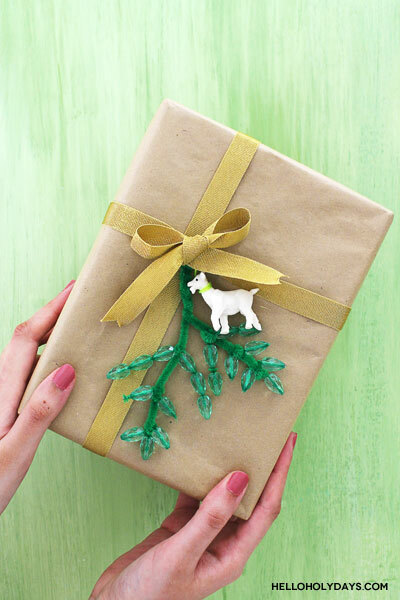 Cut a 3″ piece of green thread included in the jewelry jam kit and tie it around your plastic goat. Then tie the goat to the knot you made with your ribbon. Finally, make the ribbon into a bow. Your pipe cleaner gift topper and your mini goat should now both be tucked nicely under the bow.